Today I learned of the passing of Mary Hendricks Gendlin, PhD, wife and creative partner of the developer of Focusing, Eugene Gendlin. From 2004-2006, when I was exploring teaching Focusing in El Salvador, Mary was one of my main encouragers. She raised money for the project, and sent me off with a number of Focusing books in Spanish. In those years, she really was the heart and soul of The Focusing Institute, helping many people launch new projects. It was a great loss to the community as Parkinson’s disease took its gradual but devastating toll, and she became less and less able to interact with us and to give all she was capable of giving. She, Gene and Kye Nelson developed the Thinking at the Edge, the amazing practice that I now teach. Gene couldn’t see how to develop a process that would allow felt sensing and thinking to happen together, but Mary knew there had to be a way, and made sure that they stuck with it until the steps were in place. I am eternally grateful to the three of them for persevering in creating this beautiful system. When my mother died suddenly, I felt her spirit, huge, vital and beyond the bounds of personality. I wish that for Mary now. Mary, may your spirit finally be free. I’m thinking of one of my students, J, a young man 25 years old. He volunteers with a youth group in his community and at a camp for disabled children. I am inspired by the way he works with my classes. We first started corresponding when he signed up for a free lesson that involved reading about a Focusing experience and noticing the elements of Focusing. The homework was to practice the pause and notice one’s feelings. After a couple of weeks, he wrote back that he couldn’t do the homework because it was very difficult to pause. I replied that he did the assignment perfectly, because pausing IS difficult. I could see that he had really taken the exercise seriously. We corresponded a bit more about befriending our inner world, and how that helps one to pause. Now he is taking one of our interactive video classes. He brought a friend, R, another young man who works with youth groups, who has had no Focusing experience, but who naturally went into Focusing during the first class. The class is very interactive. That is something I value. But it takes some reaching out to find those who are willing to work with their own lives, like these young men. I want people like J and R to feel empowered and to let their lights shine. Right now I am dealing with at least three forms of software that I hoped would make my work more effective. But that’s not what is happening. So I am going to let go of at least one of the programs, and spend some time today going back to my goals. That brings me to something Gendlin has helped me to grasp. My goals evolve with my interactions. Since I started learning the software, I have had some real life experiences that show me what I love, what fulfills me, what I want more of. So on this snowy day, I will stop and let my ideas catch up to my lived experience. That’s because Focusing is a practice, not a theory. We can tune into our own felt sense as long as we have bodies, to get our own body perspective on what’s happening. Right now I am translating parts Marshall Rosenberg’s Speak Peace in a World of Conflict. I’m translating it to Spanish to be sure that I am faithfully transmitting his theory to my students in El Salvador and México. They find his theories extremely enlightening. But because I have also studied Gendlin, I want to make sure that in interacting with my students, the theory does not become more important or valid than their own lived experience. And I recognize this as a value in the Salvadoran left-wing ethos. BUT, as Rob Parker points out in our Process Model class, it is also important to read a new theory with a humble mind, rather than thinking that one can discuss it from one’s own philosophical stance. Once we have studied and understand the new theory, we can discuss it from within the new theory itself. Just got this letter from a participant in our online class, Giving Language to Stress. It feels very fulfilling to have this feedback, because it speaks to my vision, many years ago, of why I wanted to switch from being an acupuncturist to a Focusing teacher. I deeply respect acupuncture and what it can do. Acupunture is my first choice when I have a physical problem that I am not able to handle myself. And yet there are so many ways that we can improve our health by becoming aware of the patterns held silently in our bodies. I am grateful to Sue for wanting to share her story, and publish it here with her permission. “In your TAE tele seminar, Giving Language to Stress, I learnt a huge amount about how I carry stress. I have been a lifelong stress suppressor, so wasn’t very aware of my bodily manifestations of stress. Most helpful to me was the notion that we all carry stress in ways that are unique to each of us, and, of course, that what we stress about, is also unique to each person. “I learned that, for me, stress was activated by being caught by surprise, or shocked, in some interpersonal interaction. Being caught off-guard would prevent my ‘internal editor’ from checking or inhibiting my real, authentic response (in case it might cause me to experience disapproval, anger, or worse from the other person/s). This was intricately intertwined with a severe lack of assertiveness. I was doing Conflict Management in my Counselling course, and observed how hard it was for me to be assertive. This puzzled me, as I am very articulate and can argue my case well in many situations. But not, as the TAE & Stress course showed me, in situations where I was caught unawares, or was uncertain of potential responses. This was all happening at a very unconscious level. My ‘internal editor’ was protecting or guarding me, so non-Focusing approaches didn’t make much headway. “This was also one of the other benefits of TAE. The structured nature of the steps gave me what was necessary then: a way of looking at my stress that was less identified with the ‘blocking’ part, which felt ‘safer’. “Using the step of taking a situation that triggered stress, and stepping back to look at the patterns in this and another similar situation, really brought my ‘internal editor’ into clear view. I have since learnt that this response-suppression pattern consumes an enormous amount of energy, and is stress-inducing in and of itself! The cost of not being authentic is huge. “Before your class, I started going to a great chiropractor, who tested my adrenal function. This involved placing a heart rate monitor on my chest, and then simply having me stand up from lying down. This sophisticated software, used by cardiologists, reads the body’s response to this effort. Around 1000 was normal – my graph was basically flat-lining! The chiropractor asked me whether I had been under huge stress, and back then, my answer was no, because I just didn’t recognise it!! “So, a couple of years later, post your TAE course, and some good supplements (Adrenotone by Metagenics), as well as a couple of Focusing partnering session a week, my levels are up round 600+. In addition, a recent blood test showed my usually very high cholesterol levels – 7-8+ (family pattern) had dropped 2 points , as had my blood sugar levels. A new 3-class in Giving Language to Stress starts Tuesday, May 19 at 6 p.m. Eastern (Wednesday at 8 a.m. in Australia). Or sign up for private, individual sessions. Example of felt sensing from my life: I have wanted to integrate a shopping cart on my website. Experienced people had told me to go with a certain well-known ecommerce site. I signed up for the trial period, and did everything necessary to get it going. But when the time came to pull the switch and launch the new addition to my site, I felt hesitant. I lived with the discomfort for a few weeks, trying to ignore it. Finally I decided to pay attention to my felt sense. As I paid attention, my body sense became clearer. It was “the new addition won’t be true to the feeling I want on my site”. So I decided to ask my experienced advisers about it. They said, “Just go ahead, don’t worry about it”. But it still didn’t feel right. I decided to learn more about ecommerce providers, an very complex field. I did some research and found that there are some providers that are integrated with the kind of site I had designed. Then I found out about a new kind of software called learning management systems. I became very excited, because learning management systems are directed toward education, not just toward selling shoes or other commodities. The learning management system was a way to organize my classes so that they would be easily accessible to all my students in different countries. They even have a Spanish translation! My feeling that something wasn’t right led me to find a whole new system that was much more compatible with what I wanted to do, and provided opportunities I hadn’t even considered. 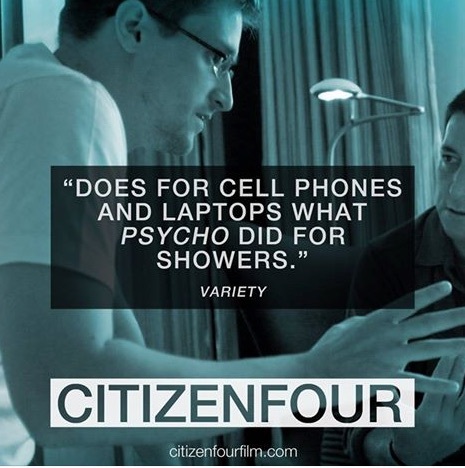 Last night I saw the documentary Citizenfour. I think everyone should see it. Despite Variety’s catchy comparison to Psycho, it is a quiet, thoughtful, inspiring film about real people. It is mostly about the 8 days in which former National Security Agency contractor Edward Snowden met for the first time with journalists Laura Poitras and Glenn Greenwald in a hotel room in Hong Kong. He had contacted them via encrypted emails in January 2013 because he was looking for the best way to tell the American public about the data on all of us that he had as a NSA contractor. We also get to know William Binney, a mathematician/cryptologist who devised a lot of the data-intercepting methods that are used today by the government. Binney had expected that his inventions would be used in a way that was consistent with the US constitution, but saw that after 9/11, data intercepting systems were used to track everyone, indiscriminately. He resigned on October 31, 2001 after 30 years with the NSA. Binney was interrogated by the FBI after contributing to a 2005 New York Times exposé on warrentless eavesdropping. In July 2007, his home office was raided by the FBI, guns drawn. They confiscated his computer, discs and personal and business records. The film also records various congressional hearings and court cases in which the issue of government surveillance was brought up and flatly denied by NSA officials or deflected by them. So Snowden knew that he had to set up his revelations very carefully. Instead of the rogue Wikilieaks style, Snowden chose to turn his information over to journalists whom he trusted would not sensationalize the issue and “make it about him”, but would open the subject for public debate. When they met for the first time in Snowden’s hotel room in June 2013, Poitras asked if she could film their interaction. We see the first uneasy meeting, and we observe Snowden as he deals quietly and poignantly with having left his girlfriend, his job, contact with his family, and stepped out into an action space where he did not know what would happen next. First Greenwald’s initial article was published in the Guardian, then Poitras’s article was published in the Washington Post –about how Verizon was turning over all client records to the NSA. The next day, Snowden followed his plan of revealing his identity, so that people would know that these revelations were coming from a concerned citizen and not from some unpredictable rogue entity. This is why I teach Focusing and Thinking at the Edge. Not all of us have Edward Snowden’s courage and commitment to act on our felt senses. Not all of us let our felt sense be known to ourselves, let alone anyone else. But in this moment, we can see the simplicity and the clear direction that happens when we give expression to implicit knowing. There is something inside that feels right. Snowden paid attention to the sense of incongruity between his work and everything he had learned as an American citizen. He also used his cognitive ability to set up his revelations in the most protected and responsible way he could, even though it led him to a place that felt like stepping off a cliff. As a species, we need to develop and trust this innately human felt sensing capacity. We all have it, if we learn how to pay attention to it. Felt sensing can never be done by computers. It is not based on “the numbers” of probability. The felt sense gives us access to the whole of our situation, in all its implications, so that we can act as human beings, and act again. My data can be tracked easily on the internet. But this same internet allows me to connect with you. And to have intimate, life-changing interactions with people in India and El Salvador. Something tells me that we have not fully grasped the implications of this ability to connect with each other. It feels more powerful than governments. As long as we pay attention to what makes us human, we can use this to go way beyond the probabilities. Learn to listen in a way that gives people the space to listen to themselves. This awakens a natural process of self-healing. Change is not one-size-fits-all. In this course, you will experience the intricate meaning that each problem holds for each individual. Once this meaning is expressed and heard, next steps naturally emerge. Parents, co-workers and helping professionals can benefit from understanding this process of change, formulated from the work of philosopher/psychologist Eugene Gendlin, PhD. Small teleclasses form monthly. Dates and times determined by participants based on their time zones. $95 for four weekly classes, 90 minutes each. Classes can be in English or Spanish. Participants must have computers, a reliable internet connection, and headphones. For more information or to sign up, contact Beatrice Blake. The system said: Welcome to Fostering. You’ll make great foster parents. We said: Thank you. We hope we can do well. The neighbors said: Aren’t you wonderful people. We said: Everyone gives back in their own way, this is just ours. The system said: You are doing a great job. We said: We are trying for the sake of the children. The neighbors said: We couldn’t do that, we would be too heartbroken when they would leave. We said: What makes you seem so uncomfortable? The neighbors said: Aren’t they lucky children to have you. We said: We are the lucky ones to have them. We said: We need help. The neighbors said: You’re just doing it for the money. We said: We were doing it before the money. The system said: We give you enough training. We said: We need more. We said: We can’t keep them any longer. The system said: You’re not good enough. We said: We are the same people we were when we started. The Focusing teacher said: There is another way. We said: Focusing does help us to deal. The Focusing teacher said: Your problems are only part of you. We said: We enjoy our other parts to help us deal with our problems part.